Station 4IP is owned and operated by the Ipswich Broadcasting Company Pty. Ltd. 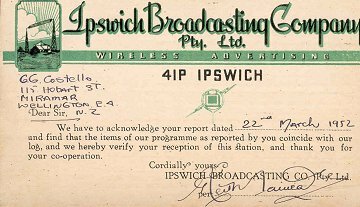 This up-to-date broadcaster was officially opened in September, 1935, and since its inception has provided high-class programmes for listeners in Ipswich and surrounding districts. The transmitter operates on a frequency of 1440 Kc’s with an aerial power of 200 watts. Programmes are radiated daily from 6.30 a.m. to 10.00 p.m. Broadcasting activities are handled by a competent staff, many with years of engineering, executive and writing experience, and all with good educational backgrounds. Standing, left to right:- A. Roach (engineer), W. Ryan (announcer), J. Twidale (prog. dept. ), M. Palmer (engineer), H. Perry (announcer), C. McNeill (prog. supervisor); R. Hunt (engineer), F. Wild (sales dept. ), K. Reilly (announcer). 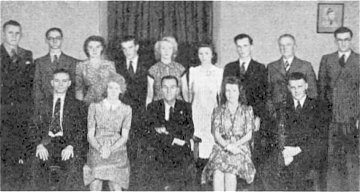 Seated, left to right:- T. Forsyth (studio manager), D. Wright (typiste), W. J. Johnson (Managing Director), C. Bolton (private secretary), K. Fairweather (chief engineer). It has always been the policy of the station to foster local talent. Every encouragement is given to performers, and many accomplished singers, instrumentalists and elocutionists have been heard through the 4IP microphone. The children’s sessions are eagerly awaited by thousands of young people who give unstinted support to the youthful artists who appear regularly in studio shows. Much juvenile talent has been discovered during these sessions. The staff is especially proud of the station’s war-time activities. Many defence establishments were located within the service area of the transmitter, and programmes were arranged to suit service personnel from many Allied countries. Listeners subscribed generously to appeals for Red Cross, Bundles for Britain, Salvage Drives, etc. War Loan Drives were wonderfully successful, and many thousands of pounds were raised through the efforts of 4IP publicity. During the last Victory Loan Campaign, the station, in conjunction with the Local War Loan Committee, embarked on an ambitious programme of “Amateur Hours,” covering wide areas. 4IP technical equipment was transported as far as 62 miles for relaying programmes from surrounding areas. From early morning to late at night, 4IP listeners are given the finest sessions it is possible to transmit. This station has the pick of the programmes. The morning request sessions, hill-billy presentations, radio serials, various competitions and Church broadcasts, enjoy very great popularity. The recorded features are selected from a comprehensive record library which includes every type of item. 4IP Ipswich 'Your Local Station for Better Entertainment', Broadcast Year Book and Radio Listeners' Annual of Australia 1946-47.